Brand: Nordicware NW-53237 Units: 1 Simply gorgeous bundt pan to create cakes, molded salads and desserts. Durable heavy cast aluminum provides superior baking performance. Baked goods rise evenly, are more finely detailed and have delicious golden crusts because of the excellent conduction of these heavy walled pans. Premium nonstick surfaces for release and easy clean-up. Special heat reflective exterior provides uniform browning. 10 cup capacity. 9" diameter. Recipe included. 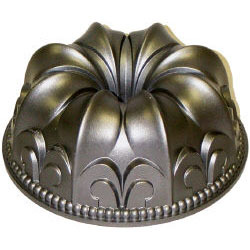 Simply gorgeous bundt pan to create cakes, molded salads and desserts. Durable heavy cast aluminum provides superior baking performance. Baked goods rise evenly, are more finely detailed and have delicious golden crusts because of the excellent conduction of these heavy walled pans. Premium nonstick surfaces for release and easy clean-up. Special heat reflective exterior provides uniform browning. 10 cup capacity. 9" diameter. Recipe included.